Denver, CO, December 19, 2017—In the last two years, following the historic Obergefell vs. Hodges landmark marriage ruling in 2015, lesbian, gay, bisexual, and transgender (LGBT) organizations have undergone a profound shift in priorities and investments. While the year after the Obergefell decision was focused on pursuing broad pro-LGBT legislation, the 2016 elections required quickly adjusting organizational priorities to fight back as LGBT equality fell under relentless attack. Despite the rapidly shifting political landscape, new data analysis released by the Movement Advancement Project (MAP) shows increased investments in LGBT organizations, perhaps as donors seek opportunities to respond to the new political climate. 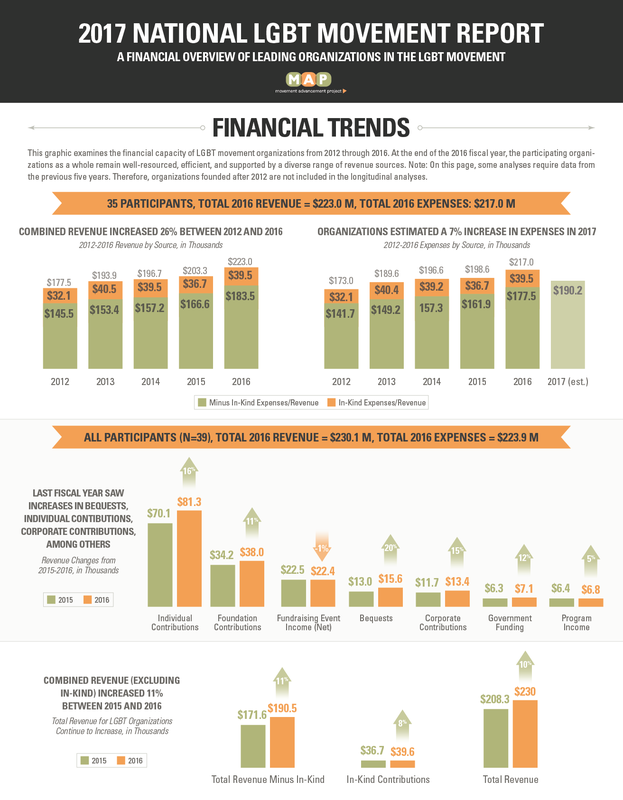 The 2017 National Movement Report provides a comprehensive and standardized look at LGBT movement’s finances for fiscal year 2016 across 39 major LGBT advocacy organizations. LGBT organizations reported an 11% increase in revenue, including a 16% growth in individual donor revenue from 2015 to 2016. Cumulatively, the 39 participating organizations had a combined 2016 revenue of $230.1 million. This report provides the first analysis of data for the year following the historic Obergefell ruling as well as budget projections for 2017. The total combined 2016 revenue for the participating organizations is $230.1 million—up 11% from 2015. The 5-year trend shows an overall 26% increase in revenue. Similarly, the 5-year trend shows a steady increase in expenses, with the largest increase occurring last year, from $198.6 to $217.0 million. 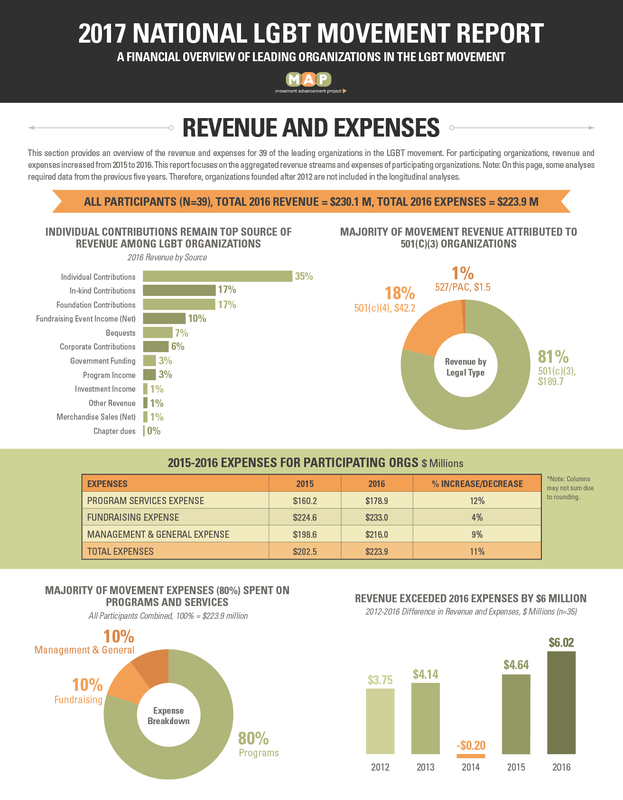 Total 2016 expenses were $223.9 million, and the majority of expenses (80%) are spent on programs and services. Participating organizations also estimated a 7% increase in expenses for the 2017 fiscal year. Individual donor contributions continue to make up the most significant source of revenue among LGBT organizations at 35% of their total revenue (link to Fundraising graphic). In 2016, participating organizations saw a 16% increase in individual contributions from 2015. Small donors have decreased by 5% between 2012 and 2016, however, the growth in large (over $25,000) and medium (between $1,000 and $25,000) donors outweighs the decline in small donors. 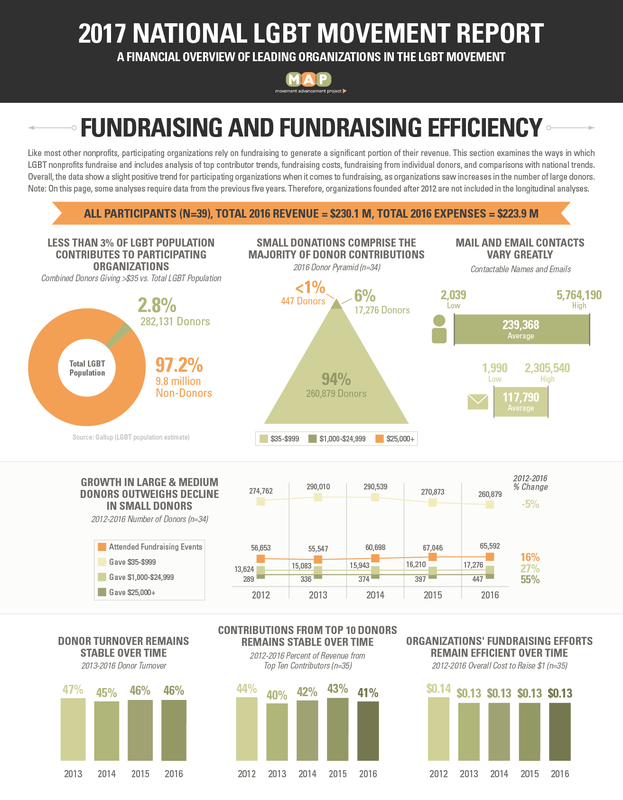 The number of large donors has increased 55% since 2012, with a 10% increase in the last year alone. The decrease in small donors (under $1,000) is still concerning as they comprise the vast majority (94%) of total donors. A majority (60%) of staff and 61% of senior staff are Caucasian, while 40% of staff and 39% of senior staff identify as Hispanic/Latino(a), African American/Black, Asian/Pacific Islander, Native American, multi-racial or other. Less diverse are the boards of LGBT organizations as nearly seven in ten (69%) board members are Caucasian. 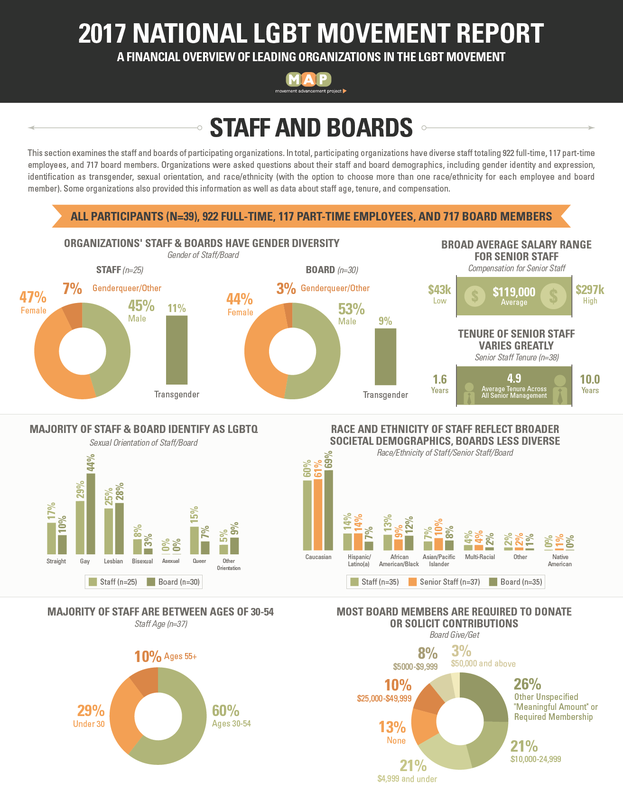 Slightly less than half of staff (47%) identify as women and 45% as men. One in ten (11%) staff identify as transgender. The majority (60%) of staff are between the ages of 30 and 54. Of organizations providing data on the sexual orientation of their staff, 54% of staff identified as gay or lesbian, 8% as bisexual, 20% as another orientation, and 11% as straight. While there has been a cumulative increase in revenue from individual contributions, the data continues to reiterate findings from previous years that very few LGBT people contribute to these major legal, advocacy and public education LGBT organizations. In 2016, only 2.8% of LGBT people donated to participating organizations, a slight drop from past years. The results of the November 2016 election will undoubtedly have a significant impact on the future of LGBT organizations—especially their fundraising capacity and expenses. As the political landscapes change for LGBT equality, tracking these trends moving forward will be crucial for understanding the financial health and stability of the movement.